The municipality of Liège (190,102 inhabitants in 2008; 6,939 ha) is the capital of the Province of Liège. The municipality of Liège is made of the former municipalities of Liège, Angleur, Bressoux, Chênée, Glain, Grivegnée, Jupille, Rocourt, Vottem and Wandre, and of parts of Ougrée (now incorporated to Seraing), Ans and Saint-Nicolas. The unofficial flag of Liège is vertically divided red-yellow. The present arms were officially granted on February 1st, 1947, and may be surrounded by several chains of military decorations. The arms of Liége show a monument or "perron". The perron is most likely derived form an actual monument in the city. It is first seen on a coin of Henry II of Limburg, as Prince-Bishop of Liège, dating between 1145 and 1165. The perron was shown freely on coins until the mid 14th century, when the symbol was placed in a shield. Whether the city at the time already used it as city arms is not known. Ever since the perron, including the base with the three lions, has been the arms of the city. The actual shape, however has varied widely during the centuries, and similarly, not all images show the lions. In the late XVIIth century the whole name, LIEGE was shown around the perron. The letters L and G appear for the first time in the late 18th century. The new logo of Liège is shown on two flags (photo), a white flag with a dark pink logo and a fla with reversed colors (with the eception of black). Created by the local firm Synthèse, the logo was officialy adopted on 21 December 2006. It is explained in a document entitled Pour une nouvelle image de la ville de Liège (For a new graphic identity of the town of Liège). A search for the logos of Liège revealed that the town has used some 20 logos. Eight examples are shown, including two versions of the municipal arms (with war decorations appended or not). On 19 October 2006, the Municipal Council launched an official bid for the design of a new logo; sixteen companies were approached, of which thirteen answered. After an information meeting held on 6 November in the Town Hall, an ad hoc Committee made of eight members (six members from the municipal administration, including the Mayor, and two external members) met on 11 December to evaluate the proposals. Following the recommendation of the Committee, the Municipal Council validated on 21 December the bid proposed by the Synthèse company, from Liège, which was granted 13,915 € for the realization of the logo. - easily reproducible by any printing process. It represents a vision of Liège integrated into the 21st century. The logo was thought on both the local and international level. To be adopted by the inhabitants of Liège, the logo should be derived from the historical and modern iconography of the town; to be understood by the neighboring countries and on the international scene, the logo should be anchored to a main symbol of the town and should use a modern graphic logic. The emblems and strong points of Liège were listed [long list skipped] and the graphic identity of competing towns (Maastricht, Aachen, Cologne, Namur, Mons, Charleroi, Hasselt, Strasbourg, Lille, Antwerp, Brussels, Trier and Luxembourg) was scrutinized. The logos of more distant towns famous for their dynamism (Bilbao, Barcelona, Berlin, Londres, Lyon and Manchester) were also considered. It was finally decided to "integrate the logo in the promotional and administrative applications of the municipal institution"; accordingly, the logo should be harmoniously integrated in the urban landscape and scenography, reflecting the urban transformation operated in Liège for some years. - the emblematic concept. The perron is the emblem of Liège, as the Copenhagen Mermaid, the London Tower Bridge, the Paris Eiffel Tower, the Berlin Brandenburg Gate etc. The towns' logos often show a well- known artwork or building. Using the collective memory is a logic choice to reach visual efficiency. - the social concept. The perron is the symbol of the town and of the liberties; it is located in the center of Liège, in front of the town hall. Known to all, it will be easily adopted. Calling for emotion is another logic choice. - the redevelopment concept. The modern design of lining and colors, turned to the future, and the resulting graphic mutation of the perron, highlight the message of redevelopment in the political strategy of the town. - the federating concept. The logo and the baseline rely on the unity and rallying concepts. The left and right vertical bars of the logo were differentiated to form a rallying "L" . These bars follow a direction while the central stroke prefigures the symbol of unity, of "one". - the innovation concept. The logo is minimalist to highlight modernity and new technologies. The "logistic multimodality", another strong point of Liège, is shown on the logo. The two outer bars represent road, river, air and rail transportation; the central bar refers to spatial industry. A curve linking the base of the logo with the tops of the four outer bars recalls the silhouette of the Guillemins railway station designed by Santiago Calatrava. - the historical concept. The perron has been widely represented since the 12th century, becoming the symbol of Liège. The new, symbolized representation of the perron is the achievement of this graphic evolution. - the growth concept. The central bar of the logo also represents ascension, growth and the direction to follow. The municipal institution shows its guidance role through its logo. 02.04. The baseline The motto is Une ville, un esprit (A town, a spirit). The word ville states that the logo belongs to the town and not to any other structure (intermunicipal authority, local event, Province of Liège). The word esprit explains that there is something else "behind the town", referring to the history and the town's aspiration to independence since the Middle Ages. Esprit can also be understood as atmosphere, highlighting the well- known local social interaction. Esprit, understood as "team spirit" [in English], announces the new boost and dynamism put in the 21st century's projects. Esprit also refer to the "hommes d'esprit" [men of wit and learning] who contributed to the fame of Liège (Gramme, Érard de la Marck, Grétry, Simenon, Rennequin Sualem, etc.). Une ... un ... increases the federating concept. A city, a spirit [English] / Een stad, een karakter [Dutch] / Eine Stadt, ein Geist [German]. In some circumstances, mostly recreational and local, the baseline can be translated into Walloon, as "Ine Vèye, ine manîre dè viker". Nouveau Larousse Illustré, Dictionnaire Universel Encyclopédique (7 volumes, published in Paris, 1898-1904) shows the flags of the main Belgian town, then based on their traditional colors. The flag shown for Liège is horizontally divided red-yellow. 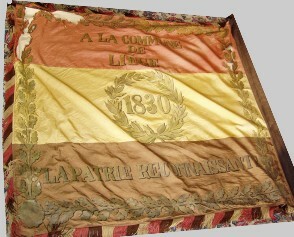 Similar honour flags were awarded in 1830 to several Belgian municipalities that had contributed to the independence. The Royal Yacht Club de la Meuse (RYCM) is located on the Monsin island, located in river Meuse. RYCM was founded in 1928, then named simply Yacht Club de la Meuse, starting out with a dozen boats. Right before and after the Second World War, international yacht gatherings named Pavillon d'Or or Pavillon Bleu. In 1977, the honorific title "Royal" was granted. The club burgee, as seen on the main page of the club website, is red with a yellow cross (the colours of Liège), offset to the hoist, and having a yellow disk (outlined red) in the cross' centre bearing the initials YCM; a red royal crown is placed above the disk. A different rendition of the burgee is available on the club journal. The rowing club Union Nautique de Liège was founded in 1873. It is located on Boverie Point, between the river Meuse and the Dérivation (diversion). The UNL has 200 rowers, 100 of them taking part to rowing competitions. Every year, the UNL organizes a long distance (8,250 m) interclub competition called Les Boucles de Liège (The Loops of Liège). The burgee of the UNL has two green triangles along the hoist, separated from the white field of the flag by a black fimbriation. A drawing on the website of the FFYB shows the burgee of UNL as above but with black royal crown in upper hoist, alluding to the honorific title of Société Royale granted to the club and the green letters UNL in the white field of the burgee. A vertically divided green-white flag is shown on a photography taken in 2004.